My friend, Joseph, sent me a note via Facebook asking me whether I would be going to Scion Exchange on Saturday. What? What is Scion Exchange? I Googled for it and found its website immediately - Scion Exchange is an event organized by The California Rare Fruit Growers (CRFG). It is a non-profit organization headquartered at California State University, Fullerton, with chapters throughout the State of California (and elsewhere) and with members throughout the world. The members of the CRFG are professionals and amateurs all dedicated to the propagation of unusual fruits and vegetables, the acquisition and spread of knowledge about these plants and the enjoyment in doing so. You can find the best varieties of fruit to grow! •Hundreds of varieties of scions (fruit wood) to graft onto your own trees, including: apples, pears, quince, plums, peaches, nectarines, apricots, cherries, and more. . .
•Questions answered, secrets revealed. . . This sounded very interesting, and Hilltop is pretty close to El Cerrito. I arrived at the event around 12:30, and the parking lot and surrounding streets were filled with cars. People were flocking to the exchange! In the courtyard, there was a fruit vendor selling various citrus fruits and yam. They all looked home grown. I tried a couple pieces of oranges, and they were quite good. Next to the entrance of the event, a crowd gathered to have their twigs grafted onto a rootstock. I turned around, and there was my friend, Bethallyn, from Master Ken's class last year! She has an urban farm complete with chickens in Walnut Creek that I must go visit sometime. I need to schedule a time with her to go over there. When I entered the room where the exchange was held, I was amazed by how enthusiastic people were over all the twigs! I have never seen anything like it. I know they are not just twigs. They are twigs with the potential to turn into trees and grow awesome sweet fruits for years and years to come and possibly graft onto other trees and continue to grow for eternity. This is what fascinates me about plants - their ability to keep on regenerating, something animals are not very good at. There was a display of "exotic fruits." I recognized many of them being tropical fruits, since I am originally from the sub-tropics. What really caught my eyes was the passion fruit. I had some fresh passion fruit at my friend's homestead farm in Oakland. They were good but small in compare to what I remember as a kid in the tropics. The one on display in the photo above is the "normal" size that I remember. Can you find it? There were many volunteers talking to people on how to graft. Master Ken was there, too! Many of Master Ken's students were there picking twigs as well. Master Ken has covered the topic of how to graft in his classes, but I have never actually done it. Now I have the perfect opportunity to do it. I picked some apple, peach, cherry, plum, and mulberry twigs to take home. I don't have a plum tree, so I am going to try grafting the plum twigs onto my peach tree. I have a non-producing cherry tree. By grafting the scions, it might grow cherries in the future. One of the volunteers convinced me to take some Morus alba mulberry scions because they are very easy to root according to her. I took some of Eileen's scions because the photos and description she included caught my eyes. Her tree is in El Cerrito practically just down the street from Sand Village Farm. 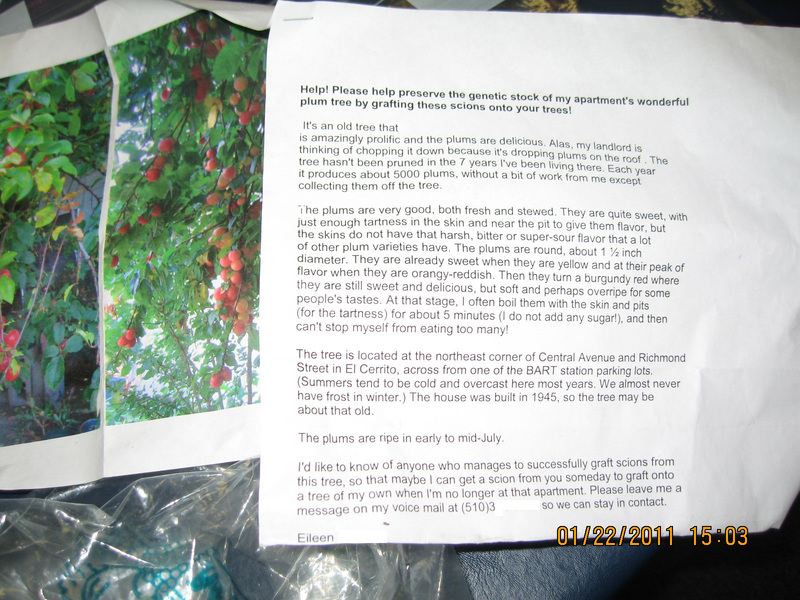 I don't know if I'll be successful in preserving her beloved plum tree on my peach tree, but I have her number and I'd like to help her eat some of those 5000 plums! Oops, I am in Business!